HandyCon is a bi annual 3 day board gaming convention held in Maidenhead every January and August. We provide lots of space for people to bring along and play their own games (and also providing a games library) as well as tournaments and events. - What kind of games are played at the con? All kinds of board/tabletop games! Whether you are a seasoned veteran or brand new to the world of board games, you are most likely find something you enjoy (and of course, others to enjoy them with!). - Can I bring along my own games? Of course! We actively encourage attendees to bring along and play their own games, but please be considerate of others and keep bags/crates clear of the walkways and out of the way of other gamers. - What is expected of me as an attendee? Good hygiene and respect for others. We ask that all attendees are considerate of other gamers and help promote an inclusive, friendly atmosphere. - Do you have an anti-harassment policy? Yes. We want to promote a an inclusive, friendly atmosphere and harassment of any kind will not be tolerated. You can find the full harassment policy here. - Is there parking at the venue and is it free? There is free parking on site at the venue for attendees (first come, first served). There is an automated parking management system in the hotel car park, but it shall be turned off from 7am on the Friday until 1am on the Monday. If you are arriving or departing outside of these times, be sure to register your car at hotel reception. You can also park in the surrounding roads, which are free to park (see highlighted areas below). - What is the nearest train station? Maidenhead Railway Station. The venue is only a 20 minute walk or a 15 minute bus ride away. - Where is the nearest bus stop? The nearest bus stop is in Norreys Drive, which is located in the road opposite the venue. You can find bus times for the westbound route (towards town) here and eastbound route (away from town) here. - What are the opening times? HandyCon runs from 9am on the Friday until 8pm on the Sunday of each weekend. For specfic dates see the pages for January and August. The HandyCon front desk is staffed 9am - 7pm each day, (so try to arrive during those times to register), but attendees are welcome to game in the designated areas outside of these hours for the duration of the convention. The hotel reception desk is open 24/7. - Can I purchase tickets on the door? We advise that people pre-book tickets online before the event to avoid disappointment, but tickets may be available for purchase on the door if they are not sold out. - What should I do when I arrive? Bring your ticket in digital or printed form to the HandyCon registration desk to sign in and collect your pass (if you don't have your ticket you will have to provide photographic ID). The front desk is staffed 9am - 7pm each day, so be sure to arrive within these times to register. If you arrive later than 7pm, come and find one of the orange shirted HandyCrew to assist you with signing in (there will most likely be at least one of us around somewhere). - Are children welcome at HandyCon? Under 16s are welcome but remain the responsibility of the accompanying adult(s) at all times. We have half price entry tickets available for those between the ages of 6 - 15. Those 5 and under do not require a pre-purchased ticket, just to be signed into the event on arrival. We also have a dedicated family zone to encourage families to meet up with each other should they wish. - How do I find players/get into a game at the con? We have a web based Looking For Players system, 'Players Wanted' signs available in the main rooms, a notice board by the front desk for posting messages and organising games as well as a Facebook group to assist in organising games before and during the con. We are also running a 'HandyCon Breakfast Club' on the Saturday to help people find others to game with (more details are available on the pages for January and August). - I'm thinking about attending by myself/for the first time and am a bit nervous. What should I expect? Walking into a room full of gamers by yourself or for the first time can be quite daunting, but don't worry, we are here to help! First off, we try and foster a friendly, inclusive atmosphere at HandyCon so that everyone feels welcome. We also have many ways to find and get into games at the con (see above) as well as tournaments and events that can be a great way to meet other gamers. If you ever find yourself overwhelmed or at a loose end, you can always ask one of the orange shirted HandyCrew to help get you into a game or assist in any way we can. If you have anything you are unsure or worried about you are always welcome to email us with any questions or concerns before the event or speak to a member of the HandyCrew during the con. - Do the open gaming areas have a closing time? The open gaming areas are open from 9 am on the Friday until 8 pm on the Sunday, meaning you are welcome to game all day and night (although we recommend getting some sleep and of course, freshening up regularly to maintain good hygiene). - How do I join a tournament or event? Some tournaments and events require pre-registration and many will be open for entry online before the event. Others you can sign up for at the con using the LFP system or just turn up for. Be sure to check the pages for January and August for details on specific tournaments and events. - How do I book accomodation? See the respective pages for January and August for details on how to book accomodation on site. Accomodation tends to get booked up relatively quickly once rooms are released, so we advise booking as soon as possible to avoid disappointment. 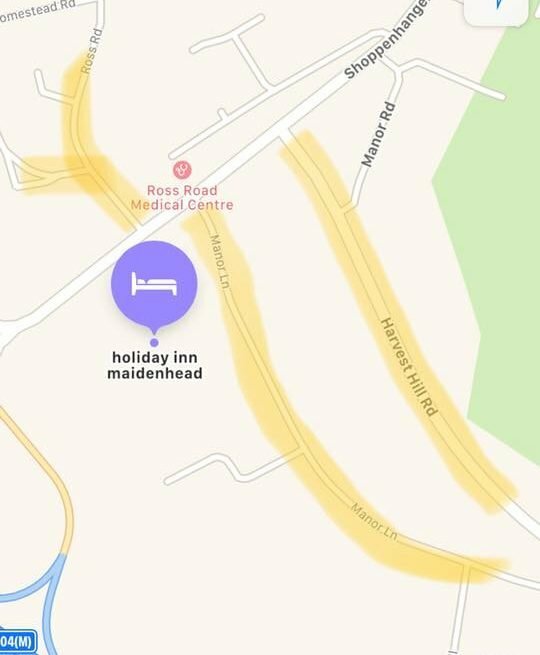 There are also many hotels in Maidenhead and the surrounding area if the venue becomes fully booked or you would prefer to stay off site. - What kind of food and drink is available at the con? The hotel has a main bar and restaurant that will have a special discounted HandyCon menu. There will also be a HandyCon bar in the function rooms. Free tea and coffee is available at the refreshment stations and attendees are encouraged to bring along their own travel mugs to help cut down on waste. - Can I bring my own food and drink to the venue? No food or drinks, except light snacks and water, can be brought or ordered in for consumption in the public areas of the hotel (such as the bar or any area of the con). Only food and drink purchased at the venue may be consumed in the public areas. - How accessible is the venue? You can find more details on our Accessibility page. - Where can I get food and drink nearby? If you would prefer to venture outside of the venue, there are many restaurants, cafes and shops in Maidenhead town center, which is a just a 20 minute walk or 15 minute bus ride away. - Can I use the heath club and pool? You can! The Health Club and swimming pool is open to all HandyCon attendees. You can find more information about opening times and facilities on the Holiday Inn website.